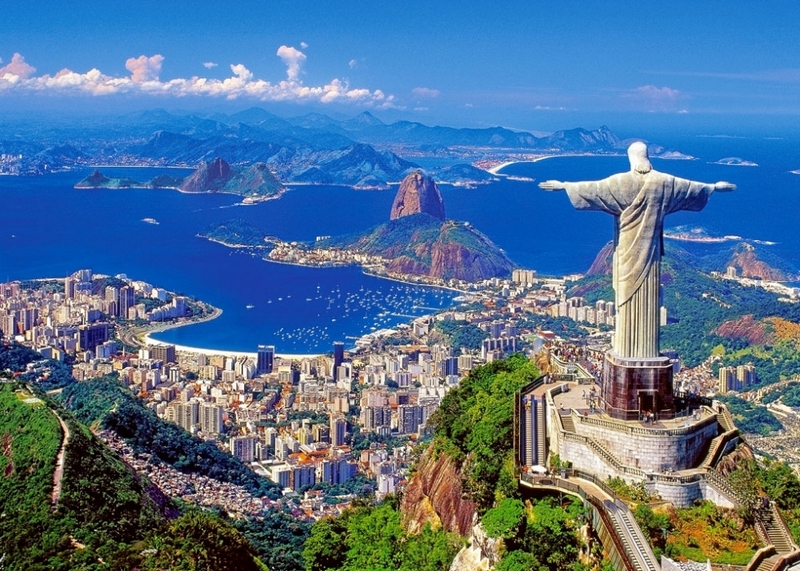 The biggest country in South America, Brazil boasts versatile nature, rich culture, and exciting cities. We have picked ten great spots to see and things to do in Brazil. Check them out! Pantanal is a tropical wetland – the largest one in the world. The famous giant Victoria Regia water lilies are found here. The tourists reach the cities located in the region usually by a small plane: flights are daily to Campo Grande and Cuiabá. The various hotels, ranches, and lodges accommodate the adventurers. Pantanal is the best place to explore the rainforest. Tourists explore Pantanal with a guide, on whom will depend what you will see. However, you will definitely see many animals and stunning nature. Visitors also explore the wetland by boats or on horses. The impressive summit spreads through three countries – Venezuela, Brazil, and Guyana. It is the highest peak of the Pakaraima mountains chain, reaching a 2,810 m (9,219 ft) height. The steep rocks form a cliff, which looks like the edge of the world! One of the most famous and popular tourist attraction in the region. The mountain can be also approached from above on an air plane tour. The service of the company is one of the main attractions in Paraná: it transports over 150, 000 people a year from Paranaguá to Curitiba and the cities in between. In Curitiba – the capital of Paraná – a lot of cultural attractions are found. Morretes is famous for its gastronomy and old architecture, as well as Paranaguá. The other route is Ponta Grossa-Cascavel. Ponta Grossa is another famous tourist destination, known for its history and hip lifestyle. A commercial city Cascavel on a west coast has borders with Argentina and Paraguay. The gorgeous Iguazu Falls are found on the border of Argentina and Paraná. The second largest Art Deco statue in the world, Christ the Redeemer ascends high on the mountain, overlooking gorgeous panorama of Rio. The idea of a statue on top of Corcovado mountain first was mentioned in the middle of the 19th century. However, it was finally resolved and the statue was completed in 1931. Posited in Tijuca National Park, on the 700 m (2,300 ft) high peak, Christ the Redeemer provides the amazing panoramic views. A trip to the top is also a little adventure: getting there by train through the tropical forest is the favorite way to go. The 4 kilometers long beach is one of the most famous in the world. The spot attracts tourists from all around the world. The promenade is filled with hotels, night clubs, and restaurants. People gather here not only to enjoy the sun and water: the New Year’s Eve and important football victories are celebrated here. And Brazilians are famous for knowing how to celebrate well! The iconic beach is one of the most popular and famous in Brazil. Founded in the 16th century by the Portuguese, the city first served as a village, which gradually grew into the economic capital of Brazil. Today the megacity has the most exciting nightclubs ever, where champagne and luxurious liquors flow freely. Also, the abundance of great restaurants attract visitors, who are willing to discover the versatile local cuisine. One of the most vibrant Brazilian cities. In 1502, when the Portuguese explorers discovered the bay, they were amazed by the astonishing bay. Weird shaped mountains and rocks were never seen before by the Europeans. Today it is one of the most recognizable sites in Brazil. Also, visit historic Rio de Janeiro Botanical Garden opened in the early 19th century. Visit the peak of Corcovado, where the famous statue of Christ the Redeemer stands. From here amazing views to the harbor open. Known as the desert lagoons found among the sandy dunes, these natural wonders attract visitors from July to September. A sandy scenery is not a desert, though. But it definitely looks like one, therefore, the lagoons add up to the uniqueness of the park. Water is crystal clear, warm and perfect for swimming. This is a true natural wonder, worth seeing and having a refreshing dip in. Not very tall (285 ft/87 m), but very impressive: the waterfall has 275 cascades, that form a horseshoe and stretch for 8858ft (2700 m). It is taller and twice as wide as Niagara Falls. Iguazu Falls are surrounded with national parks in both countries. Fed by Iguazu River, the beautiful falls are of volcanic origin. Experience the enormous plunge and force of water as well as the unspoiled surroundings of this gorgeous place. The biggest parade in the world is held before Lent. The samba dancers prepare all year long: the technique, performance, costumes, decorations – everything has to be perfect and bigger than their competitors’. One of the most famous and exciting carnivals in the world!